The magnetic field strength is 25 Gauss, or 50 times stronger than the magnetic field at the surface that makes compass needles align north-south. Though this number is in the middle of the range geophysicists predict, it puts constraints on the identity of the heat sources in the core that keep the internal dynamo running to maintain this magnetic field. "This is the first really good number we've had based on observations, not inference," said author Bruce A. Buffett, professor of earth and planetary science at UC Berkeley. "The result is not controversial, but it does rule out a very weak magnetic field and argues against a very strong field." The results are published in the Dec. 16 issue of the journal Nature. A strong magnetic field inside the outer core means there is a lot of convection and thus a lot of heat being produced, which scientists would need to account for, Buffett said. The presumed sources of energy are the residual heat from 4 billion years ago when the planet was hot and molten, release of gravitational energy as heavy elements sink to the bottom of the liquid core, and radioactive decay of long-lived elements such as potassium, uranium and thorium. A weak field  5 Gauss, for example  would imply that little heat is being supplied by radioactive decay, while a strong field, on the order of 100 Gauss, would imply a large contribution from radioactive decay. About 60 percent of the power generated inside the earth likely comes from the exclusion of light elements from the solid inner core as it freezes and grows, he said. This constantly builds up crud in the outer core. The Earth's magnetic field is produced in the outer two-thirds of the planet's iron/nickel core. This outer core, about 1,400 miles thick, is liquid, while the inner core is a frozen iron and nickel wrecking ball with a radius of about 800 miles  roughly the size of the moon. The core is surrounded by a hot, gooey mantle and a rigid surface crust. Buffett is a theoretician who uses observations to improve computer models of the earth's internal dynamo. Now at work on a second generation model, he admits that a lack of information about conditions in the earth's interior has been a big hindrance to making accurate models. He realized, however, that the tug of the moon on the tilt of the earth's spin axis could provide information about the magnetic field inside. This tug would make the inner core precess  that is, make the spin axis slowly rotate in the opposite direction  which would produce magnetic changes in the outer core that damp the precession. Radio observations of distant quasars  extremely bright, active galaxies  provide very precise measurements of the changes in the earth's rotation axis needed to calculate this damping. By calculating the effect of the moon on the spinning inner core, Buffett discovered that the precession makes the slightly out-of-round inner core generate shear waves in the liquid outer core. These waves of molten iron and nickel move within a tight cone only 30 to 40 meters thick, interacting with the magnetic field to produce an electric current that heats the liquid. This serves to damp the precession of the rotation axis. The damping causes the precession to lag behind the moon as it orbits the earth. A measurement of the lag allowed Buffett to calculate the magnitude of the damping and thus of the magnetic field inside the outer core. Buffett noted that the calculated field  25 Gauss  is an average over the entire outer core. The field is expected to vary with position. 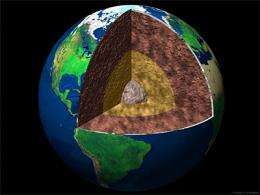 Probing Question: What heats the earth's core? That's very interesting. I remember a Nova episode from last season on PBS with the basic premise being that the internal dynamo that sustains the earth's magnetic field may have shut down. It's nice to see confirmation that this isn't so. I think you may be misremembering the Nova episode. Generally the worry is that the dipole moment of the magnetic field is weakening in favor of higher order multipole moments. The dynamo doesn't shut down, but sometimes becomes disordered. if this were true, perhaps it could help explain why mars does not have a strong magnetic field? I think you may be misremembering the Nova episode. Phobos and Deimos are tiny. Probably captured asteroids. And what about Mercury's magnetic field? Are Venus's complete lack of a B-field and retrograde rotation related? This article was great. My intuition (or whatever) tells me that some day we'll discover solar coupling into the magnetosphere also feeds the geodynamo, and similar processes on other planets. The first story is patent guesswork - no one knows exactly how the earth got it's magnetic field. The second story [dynamo theory] is a requirement forced onto the naturalists to explain why earth STILL has a magnetic field after 4 billion years, instead of it being dead and gone. Currently the earth's magnetic field is decaying at a rate that is pointing to an early demise for life on earth. Naturalists want to point out that the field is changing polarity as the reason for the decay but that doesn't hold up - we should be seeing how North is shifting at the same rate as the field is decaying - and it's NOT. The earth's magnetic field is only about 6 k years old. I would have expected it to be so much higher in the core given that an MRI can be 30,000G. I know there are some clever guys on here, can anyone tell me why no one ever thought of building a huge magnetic motor at the north and south pole to harness the earths magnetic field? Or maybe even small trickle charging stations that convert the magnetic field into electricity anywhere on the surface? I can imagine the field is weak on the equator, but gets stronger as you get closer to the poles, hence the northern lights. In order to produce an electric current, a wire loop would have to have a changing magnetic flux through the area it encompasses. 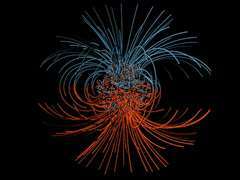 The Earth's magnetic field is more or less static, so it would be a terrible power source.